Bub and I hit the road in my new cruising car and chose Townes Van Zandt’s Pandora station. From Fossland’s Paradise in Catalina, Arizona, we drove east for about 2 hours on I-10 to the Dragoon turnoff. Tall stands of sunflowers lined the median and sides of the highway as we passed Benson. Big white fluffy clouds danced in the blue, blue sky. Heading south from I-10, we sped another 60 miles down through Dragoon to AZ route 191 through Sunsites and then turned east on AZ route 181. The long, straight two-lane road had little traffic. Groves of pecans and pistachios lined the road with sparsely populated fields and ranch houses. We sang along (or at least, I did) with the music until we saw the sign pointing to the vineyards. We were welcomed by one of the family who pointed towards Jan Schaefer, one of the owners. She was presenting each guest with a commemorative glass and an invitation to sample and taste their 2018 Harvest. Tables were filled with bottles of wine, chilled and at the perfect room temperature, depending on the wine. A list of all their offerings helped determine which to sample. Jan’s partner, Rod Keeling explained the process and showed how they know when it is the perfect time to pick and process the grapes. A locally sourced gourmet lunch catered by Cafe’ Roka of Bisbee delighted us as we paired it wine pourings. The outside and inside spaces of Rod & Jan’s house were set with tables and chairs to accommodate all of the guests. Our invitation had come because we decided to join their wine club. 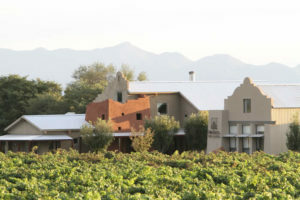 Three times a year, they open their home and winery for a celebratory party such as this one. I sampled a rose, appropriate for the 100-degree weather as well as the Home Place Reserve but found myself returning to my very favorite wine, Keeling Brothers. In 2013, we discovered the Keeling Schaefer wines at Costco, of all places. It was immediate love! Bub’s sister lives outside of Wilcox in Dos Cabezas and has been bringing us bottles for special occasions. For the last several years, our favorite wine has been the Three Sisters. 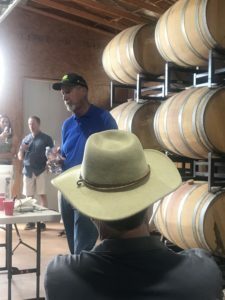 This last Spring when we attended the Wilcox Wine festival, we tasted the “Keeling Brothers” Shiraz, which is made Australian style with American oak. Wow is all I can say! I’m afraid I fail terribly at giving you a proper wine connoisseur description with fruits and notes. My view is that the color is a gorgeous dark red. The taste is smooth and rich and the alcohol content is 15%. Shhhhh…..Bub said I shouldn’t tell you about this since they have limited quantities and he doesn’t want them to sell out. The Wilcox Spring Wine Festival, May 18 & 19, 2019, will be one to put on your calendar. 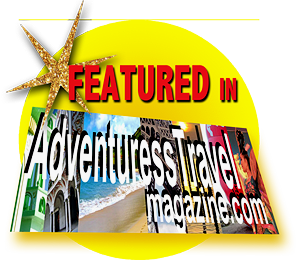 If you want to have some fun, plan take this road trip or book a room to stay the weekend! 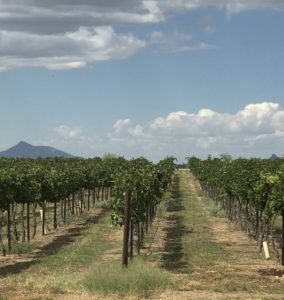 Their wines are available at over 180 locations in Arizona, including many fine restaurants and grocery stores, such as AJ’s and Whole Foods.